Mike is a full blooded Navajo, born and raised in Vanderwagen, New Mexico. He is serving as pastor of FIBC for the last 15 years. Purpose of FIBC is to spread the Gospel of Jesus Christ for the salvation of souls, and to teach the Word of God so believers may be established in the faith as taught by God's Word. Located in the historic downtown Flagstaff, at 10 West Cherry Ave.
"Entering to Worship the Lord and Leaving to make Christ Known"
A warm welcome from FIBC, and thank you for visiting here. If you are looking for a Church where the Lord Jesus Christ and His Word is exalted then we invite you to come, visit and worship with us. FIBC is a Bible believing church, and submits to the authority of God's Word. 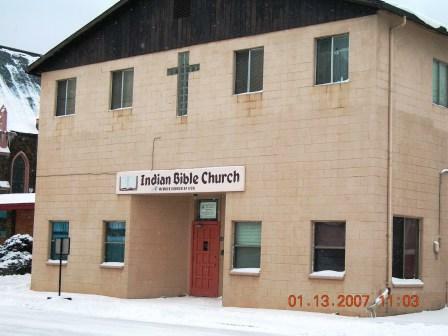 The adult Sunday School lessons are taught both in English and the Navajo languages. Majority of the congregation are members of the Navajo Tribe, (The "Dine"-The People). However, there are non-natives that are participating, contributing and using their spiritual gifts to the edifying of the Body of Christ. Our focus is primarly to worship and exalt our Lord and Savior Jesus Christ. He has redeemed us by His precious blood that He shed at Calvary. We have experience the forgiveness of our sins, when we received Him as our personal Savior. He has empowered us to live victoriously for Him each day. We are actively waiting for our Lord Jesus Christ to return and to meet Him in the air, when the Rapture of the Church occurs. Our mandate is to fulfill the Great Commission of presenting the Gospel and discipling those that have received the free gift of eternal life by faith. FIBC is a mission minded church, in that we support several Missions serving the Lord in various parts of the world. Several believers have gone on short term Missions Trips to other countries like, Mongolia; India; South America, Africa, Canada, Mexico and Siberia.